"Having an interactive platform that can get information to critical employees, right in their hands, instantaneously, is really powerful." As a trusted source of business-critical functions for clients in healthcare, logistics, and other fast-moving fields, Peak 10 understands the importance of 24/7/365 uptime, even in the face of a crisis. Ensuring disaster recovery and effective emergency preparedness is no easy feat: Peak 10 has dozens of data centers scattered across the country. Hundreds of employees, including engineers and other mission-critical staff, work to ensure 24/7 service to their clients. Previously, Peak 10 maintained a emergency management and business continuity documents on the company Intranet with printed copies for offline reference. However, the sheer amount of information was a challenge for each employee to learn. In an emergency, remembering exactly what to do was nearly impossible, and referencing the lengthy documents wasted precious time. The approach simply wasn’t working for a company that requires 24/7 uptime and a quick, decisive response to any incidents. David Kidd, Vice President of Governance, Risk, and Compliance at Peak 10, is in charge of making sure the company is ready to handle emergencies and keep its data centers running for clients at all times—even under adverse conditions. Kidd stumbled across RockDove Solution’s In Case of Crisis app on Apple’s App Store. During a demo with the RockDove Solutions team, he started to see the app’s potential at Peak 10. The company decided to incorporate In Case of Crisis to digitize its emergency preparedness plans, improve communication, and put vital information into the hands of its employees. 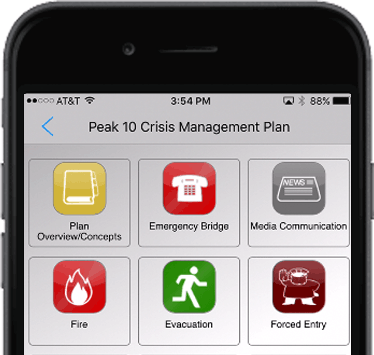 Peak 10 used the In Case of Crisis Web interface to digitize and implement its existing emergency preparedness plans and then rolled them out to its engineering and operations staff. 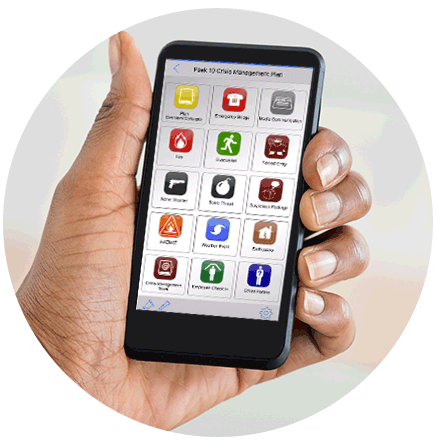 The app includes quick and easy access to vital information, such as what to do in a medical emergency, during severe weather, or in case of a utility outage. The Peak 10 team also added brand-new capabilities, such as field reports that mission-critical employees can complete on the app and then instantly send back to the emergency operations team. Employees also enjoy one-button access to important features such as the company’s emergency call bridge and an employee check-in feature that is used during emergencies. Additionally, they can quickly access an HR ethics hotline, contact information for the emergency preparedness team, data center run-book plans, and more. 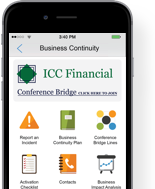 The app also enables employees to instantaneously issue an emergency notice across the company in a wide range of scenarios. Founded in March 2000, Peak 10 is an IT infrastructure provider headquartered in Charlotte, N.C. 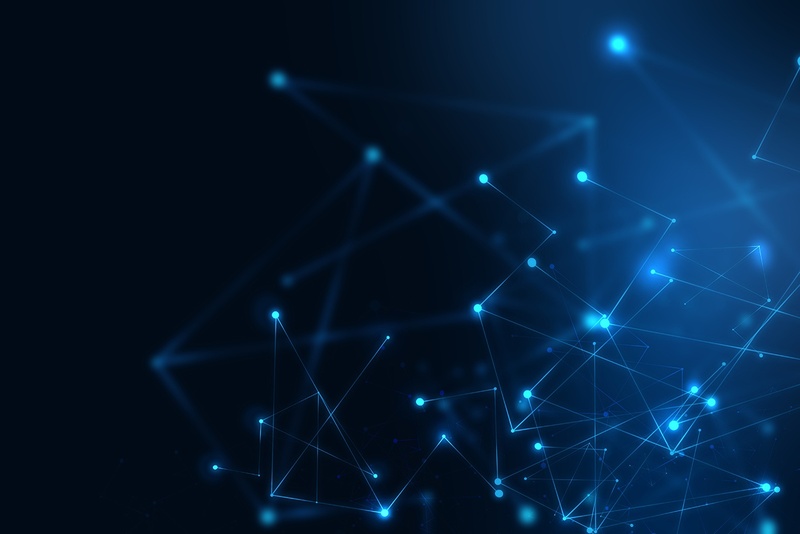 The company offers enterprise-class data center space, reliable network services, cloud solutions, and managed services to customers across the country. Its leading products include data protection and security, application management, disaster recovery solutions, and encryption as a service. The Peak 10 employees have wholeheartedly embraced In Case of Crisis. Kidd said the company’s hundreds of users easily downloaded the app, received some quick training, and were ready to use it. “Particularly those who are directly involved in managing the uptime of the systems and keeping everything going—they were thrilled to have something like this in their hands,” Kidd said. One of the key features for Peak 10 is flexibility. Not only was the company able to easily digitize its existing plans, but it could also make them more interactive and usable than it could have imagined. The new system is already living up to expectations. It was put to the test not long after being installed, when a significant hurricane hit the Florida coast, where Peak 10 has several data centers. Kidd said the Peak 10 team will continue to roll out In Case of Crisis to new employees and, when necessary, add new planning documents. The company also plans to explore how the app can help it optimize its crisis response time and recovery. "The technology goes beyond what you can get with standard documentation and training. It gives you something that is directly actionable, in your hands, and available at a moment’s notice." 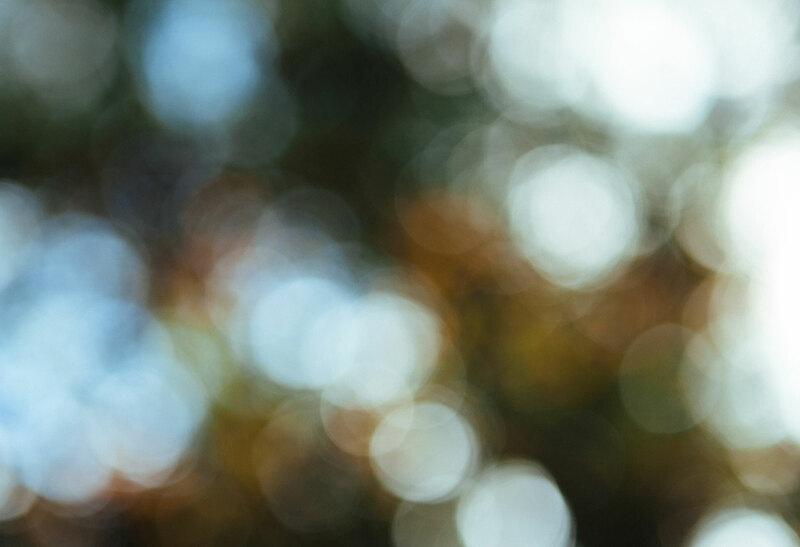 Should you build a mobile solution in-house to operationalize your plans?